What Does the Archaeological Dating "cal BP" mean? What Does cal BP Mean? The scientific term "cal BP" is the abbreviation for "calibrated years before the present" or "calendar years before the present" and what that is references the fact that archaeologists have discovered wiggles in the radiocarbon curve which produces usable dating. Adjustments to that curve to correct for the wiggles ("wiggles" really is the scientific term used by the researchers) to are called calibrations. The designations cal BP, cal BCE, and cal CE (as well as cal BC and cal AD) all signify that the radiocarbon date mentioned has been calibrated to account for those wiggles; dates which have not be adjusted are designated as RCYBP " radiocarbon years before the present." Radiocarbon dating is one of the best known archaeological dating tools available to scientists, and most people have at least heard of it. But there are a lot of misconceptions about how radiocarbon works and how reliable a technique it is; this article will attempt to clear them up. All living things exchange the gas Carbon 14 (abbreviated C14, 14C and most often 14C) with the atmosphere around them—animals and plants exchange Carbon 14 with the atmosphere, fish and corals exchange carbon with dissolved 14C in the water. Throughout the life of an animal or plant, the amount of 14C is perfectly balanced with that of its surroundings. When an organism dies, that equilibrium is broken. The 14C in a dead organism slowly decays at a known rate: its "half-life." The half-life of an isotope like 14C is the time it takes for half of it to decay away: in 14C, every 5,730 years, half of it is gone. So, if you measure the amount of 14C in a dead organism, you can figure out how long ago it stopped exchanging carbon with its atmosphere. Given relatively pristine circumstances, a radiocarbon lab can measure the amount of radiocarbon accurately in a dead organism for up to 50,000 years ago; after that, there's not enough 14C left to measure. There is a problem, however. Carbon in the atmosphere fluctuates, with the strength of the earth's magnetic field and solar activity, not to mention what humans have thrown into it. You have to know what the atmospheric carbon level (the radiocarbon 'reservoir') was like at the time of an organism's death, in order to be able to calculate how much time has passed since the organism died. What you need is a ruler, a reliable map to the reservoir: in other words, an organic set of objects that track annual atmospheric carbon content, one that you can securely pin a date on, measure its 14C content and thus establish the baseline reservoir in a given year. Fortunately, we do have a set of organic objects that keep a record of the carbon in the atmosphere on a yearly basis— trees. Trees maintain and record carbon 14 equilibrium in their growth rings—and some of those trees produce a ring for every year they are alive; the study of dendrochronology, also known as tree-ring dating, is based on that fact of nature. Although we don't have any 50,000-year-old trees, we do have overlapping tree ring sets dating (so far) back to 12,594 years. So, in other words, we have a pretty solid way to calibrate raw radiocarbon dates for the most recent 12,594 years of our planet's past. But before that, only fragmentary data is available, making it very difficult to definitively date anything older than 13,000 years. Reliable estimates are possible, but with large +/- factors. As you might imagine, scientists have been attempting to discover organic objects that can be dated securely pretty steadily for the past fifty years. Other organic datasets looked at have included varves, which are layers of sedimentary rock which were laid down annually and contain organic materials; deep ocean corals, speleothems (cave deposits) and volcanic tephras; but there are problems with each of these methods. Cave deposits and varves have the potential to include old soil carbon, and there are as-yet unresolved issues with fluctuating amounts of 14C in ocean currents. A coalition of researchers led by Paula J. Reimer of the CHRONO Centre for Climate, the Environment and Chronology, School of Geography, Archaeology and Paleoecology, Queen's University Belfast and publishing in the journal Radiocarbon, has been working on this problem for the last couple of decades, developing a software program that uses an ever-increasingly large dataset to calibrate dates. The latest is IntCal13, which combines and reinforces data from tree-rings, ice-cores, tephra, corals, speleothems, and most recently, data from the sediments in Lake Suigetsu, Japan, to come up with a significantly improved calibration set for c14 dates between 12,000 and 50,000 years ago. In 2012, a lake in Japan was reported to have the potential to further finetune radiocarbon dating. 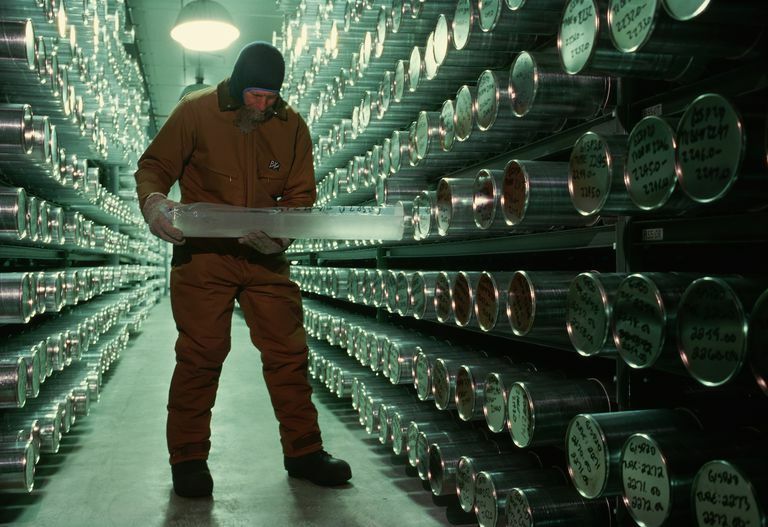 Lake Suigetsu's annually formed sediments hold detailed information about environmental changes over the past 50,000 years, which radiocarbon specialist PJ Reimer says are as good as, and perhaps better than, the Greenland Ice Cores. Researchers Bronk-Ramsay et al. reported 808 AMS dates based on sediment varves measured by three different radiocarbon laboratories. The dates and corresponding environmental changes promise to make direct correlations between other key climate records, allowing researchers such as Reimer to finely calibrate radiocarbon dates between 12,500 to the practical limit of the c14 dating of 52,800. When were our oldest domesticate relationships established (dogs and rice)? When did the Neanderthals die out? When did humans arrive in the Americas? Most importantly, for today's researchers, will be the ability to study in more precise detail the impacts of previous climate change. Reimer and colleagues point out that this is just the latest in calibration sets, and further refinements are to be expected. For example, they've discovered evidence that during the Younger Dryas (12,550–12,900 cal BP), there was a shutdown or at least a steep reduction of the North Atlantic Deep Water formation, which was surely a reflection of climate change; they had to throw out data for that period from the North Atlantic and use a different dataset. Adolphi F, Muscheler R, Friedrich M, Güttler D, Wacker L, Talamo S, and Kromer B. 2017. Radiocarbon calibration uncertainties during the last deglaciation: Insights from new floating tree-ring chronologies. Quaternary Science Reviews 170:98-108. Bronk Ramsey C, Staff RA, Bryant CL, Brock F, Kitagawa H, Van der Plicht J, Schlolaut G, Marshall MH, Brauer A, Lamb HF et al. 2012. A complete terrestrial radiocarbon record for 11.2 to 52.8 kyr B.P. Science 338:370-374. Currie LA. 2004. The remarkable metrological history of radiocarbon dating [II]. Journal of Research of the National Institute of Standards and Technology 109(2):185-217. Libby WF. 1967. History of Radiocarbon Dating. Symposium on Radioactive Dating and Methods of Low-level Counting. Monaco: International Atomic Energy Agency. Reimer PJ. 2012. Atmospheric science. Refining the radiocarbon time scale. Science 338(6105):337-338. Reimer P, Baillie M, Bard E, Bayliss A, Beck J, Blackwell PG, Bronk Ramsey C, Buck C, Burr G, Edwards R et al. 2009. IntCal09 and Marine09 radiocarbon age calibration curves, 0-50,000 years cal BP. Radiocarbon 51(4):1111-1150. Reimer PJ, Bard E, Bayliss A, Beck JW, Blackwell PG, Bronk Ramsey C, Buck CE, Cheng H, Edwards RL, Friedrich M et al. 2013. IntCal13 and Marine13 Radiocarbon Age Calibration Curves 0–50,000 Years cal BP. Radiocarbon 55(4):1869–1887. What Do Archaeologists Mean by BP, and Why Do They Do That?